Acronis True Image 2017 for MAC Review and Discount Code. 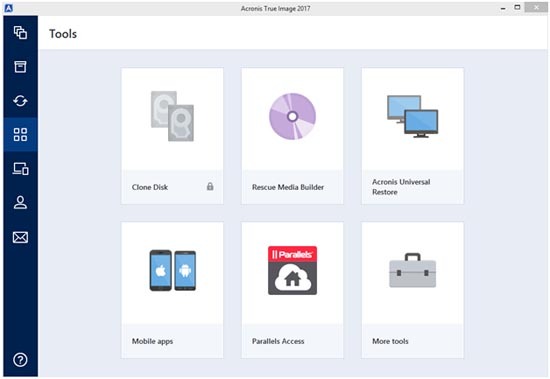 The Recovery experience on Acronis True Image 2017 for MAC. Acronis True Image 2017 for MAC will allow your local backups to be encrypted and that means extra security against data theft or viruses. Cloud data is automatically encrypted thus you don�t have to worry about encrypting manually. The software is also capable of backing up your parallel Windows virtual machine especially when it is in its active state. The software also comes with the Acronis bootable rescue media, which will automatically boot, if the system�s drive does not boot- this means you don�t have to rely on your system drive to boot before you can backup and retrieve your files and data. 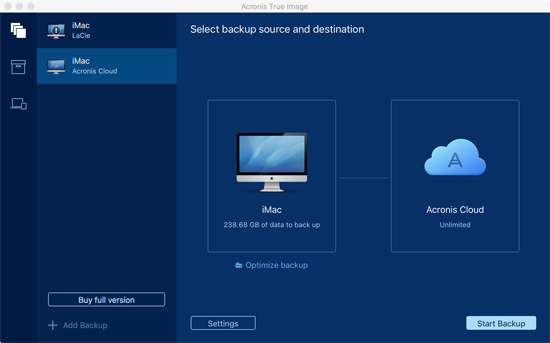 Acronis True Image 2017 for MAC will keep the last 10 backups for you, just for roll back, the first backup will be a full copy while the remaining copies will be the �changes� only. The oldest versions of the backup will be deleted and those start from the 11th backup. With the roll-only backup, you can access as many information as possible, especially when you use several devices at different times to create backup for your needs. Acronis True Image 2017 for MAC seems to be perfect backup software for Mac users, but surprisingly, there seems to be some limits with the usage of the software. This software does not support Mac Operating systems using Bootcamp, File Vault 2, and Fusion Drive. For those who want to backup their files on mobile devices, the File Vault 2 requirement may be a huge pull-off, while those who use iMac computer will find the limitations of Fusion drive somehow frustrating. You need to check for these extra requirements on your Mac devices before downloading and installing Acronis True Image 2017 for MAC. Despite these limitations, Acronis True Image 2017 for MAC still remains the best alternative backup software in the world. One of the great things about Acronis True Image 2017 for MAC is that you can do normal things while the backup is going on, for instance, you can surf the internet, send emails, and even watch videos. When the backup completes, you will notice that the software will compress the files and you can save as much as 20% of the original size of your files. You can also detect that the compression of video backup will make the whole backup process more than 20% faster than backup through rsync or some other similar software. Once the backup has been created you can choose to create a bootable rescue media within the backup drive, and when you complete this, you can start using the usual Mac procedure which is- booting by holding down the option key, this will allow you choose the backup volume, and the window will give you some other choices. If you want to recover a file, you can simply choose the recover option and a search window will pop up. Try as much as possible to recover into the same location because it is the easiest recovery choice you have. Acronis True Image 2017 for MAC comes with a very easy user interface that anyone can use. The software will measure the capacity of its storage in Gib and not in GB, and it does not use the real name of your Mac, instead, it uses the name �My Mac�. Acronis True Image 2017 for MAC makes use of an hierarchical text mode, to open the file recovery text mode. There is no search option in this situation thus, looking for a file can be a little difficult when you don�t know where it is located. The inability of to recover a file in the local storage within a Non-Acronis Mac device can frustrate some Mac users; therefore you need the Acronis app to simplify things. Pricing of Acronis True Image 2017 for MAC is quite reasonable, Acronis True Image 2017 for MAC prices start from $49.99, however if you have 3 Mac systems, then you can purchase 3 licenses for around $79.99. there are some other storage options available and these are; $49.99 per year for a 250GB storage, and about $190 for 1TB of storage. The yearly storage plan can be the perfect money-saver especially for those who do not store or backup more than 1TB of storage, however, business entities who require higher storage may go for the one-time payable package. It can be difficult to find a cheaper alternative to the Acronis True Image 2017 for MAC, especially for MAC users, considering the dependability of Acronis products. Acronis True Image 2017 for MAC will definitely remain the number one backup choice for Mac users, considering the fact that many backup software are not compatible for Mac devices. -Not all Mac OS are supported, for instance, Mac systems using Bootcamp, Fusion drive and File Vault 2 are not supported. -It does not have a file search option, thus it can be tedious when you don�t know the exact drive or location where a file is located. -The software has a limited usage, it does not work with Windows OS , neither does not work for android and IOS, you can only use it on Mac devices.